This is one of those desserts that so good it makes me want to cuss when I taste it. But the beauty of this little dessert also lies in how simple it is to make. I mean seriously. This took 10 minutes and one bowl to mix up. So that means you, my friend, are 10 minutes away from this rich, delicious, protein-packed, foodgasmically good treat! Doesn’t that look lovely??? Now I’m a big believer in having holiday dessert alternatives. Or anytime dessert alternatives. Mostly because I don’t believe willpower alone is enough to get us over the hump sometimes. There are just going to be days when you want dessert like everyone else! Never mind that dessert is a meal unto itself for most of us. You just want dessert and you want it now! I can relate. And I’m here for you. There’s not a thing wrong with having dessert (and never trust anyone who says there is!) but you have to choose the right dessert. You can also check out their website to find out where it’s sold near you. In addition to that, I amped up the chocolate factor just a smidge with the use of a tablespoon of unsweetened cocoa powder. That, along with the Cafe Bustelo instant decaf espresso (seriously guys…that stuff is LIFE CHANGING!) makes the whole thing so rich that when you taste it your eyes will literally roll back in your head. Please warn your family that will happen. They tend to get concerned at such things. In reality, if you are looking for another shortcut, you could just get the sugar-free chocolate fudge pudding mix instead of regular chocolate. It basically does the same thing that adding the cocoa powder does (I just used what I had on hand in my kitchen). Anyway…with that, I commission you to go, make festive desserts! Play with your food! 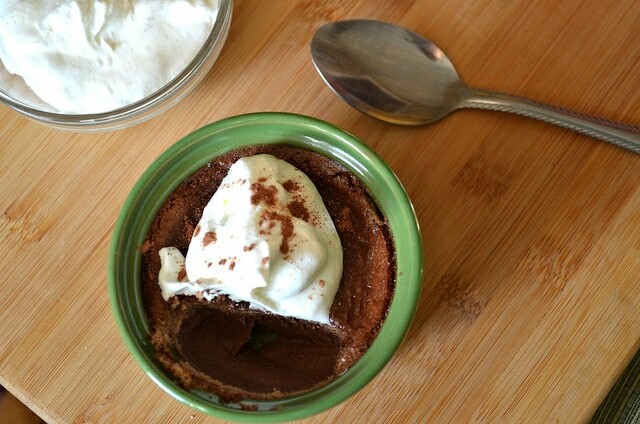 In a mixing bowl, combine pudding mix, protein, instant espresso and cocoa powder. Whisk to thoroughly combine. The mixture should start setting fairly quickly. Divide the mixture equally into four cups. Refrigerate cups for an hour before serving. NOTE: Because you've added protein, the pudding will be a bit firmer than normal pudding (mousse-like). When serving, top with whipped cream and crushed sugar-free peppermint pieces for garnish, if desired.